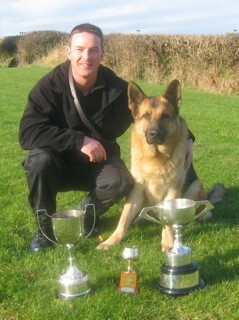 K9guss Dog Training in Bristol and Bath. My name is Andy Gussey and I have over thirty years of experience in dog training. I have been helping other people train their dogs since around 2001 and have worked with a wide variety of different breeds from Great Danes to Border Terriers and all sorts in between with a variety of training needs. I have trained pet dogs, gun dogs, Police dogs and even an assistance dog. I have always owned English Springer Spaniels, I love their energy and character. I was brought up surrounded by working gun dogs becoming involved in their training as soon as I was old enough and later working them myself. In 1998 I realised a life long ambition by becoming a Police Dog handler. I worked German Shepherd general purpose dogs and a Springer Spaniel specialist search dog for a total of 11 years. During this period I was lucky enough to work with and learn a great deal from Andrew Lloyd who was the National Police dog Champion in 1999. I also represented the Avon and Somerset Police at Police Dog Trials several times, winning the South West and Wales Regional Obedience trophy twice as well as trophies for Searching and Criminal Work. I have done many talks and demonstrations including the main ring in front of a crowd of thousands at the Bath and West show. Every dog is different and so I can provide personal one-to-one training for your dog to help get the most out of it's training. I can take on private training of puppies and older dogs, to train the dogs to do the things that are important to you so that you have the best relationship possible and can enjoy walking and playing with your dog. Being local to Bristol and Bath, we can run sessions at your home, in a park or other convenient public place should this be desired. To get to know you and your Dog, I hold a consultation session with you to find out what sort of things you are looking for and to understand how best to train the dog. This session lasts about 90 minutes and costs £50. After the consultation, each session costs £45 and last 60 minutes. Please Note: All classes are on hold for the time being, until at least the spring of 2018. I will post an update when they are beginning again. In 2014 I was asked to take on the training classes at Latchetts Kennels, in Keynsham. We now run classes for puppies, beginners and more advanced dogs where we work towards the Kennel Club Good Citizen Awards Scheme and beyond. Classes start from £6 per session. Check out the Latchetts Kennels training area for more information. I am committed to using positive reinforcement in my training methods and there can be no doubt that a happy dog is more receptive and responsive to training. Socialisation with other puppies is great fun and important for your puppies development. We focus our training on walking nicely on the lead and recalling as well as basic positions, and talking through common puppy problems. An introduction to basic dog training including, walking to heel, recalling, sit, stand, down, stay for one minute, control around people and other dogs with the opportunity to go on and achieve the Kennel Club Good Citizen Bronze Award. For those who have already gained the Kennel Club Good Citizen Bronze award or could easily achieve it, to progress to the Silver / Gold Awards and beyond. Including heeling on and off lead, long stay, stopping the dog, recall from distractions, send to bed, agility and more. In 2014 I was approached by Felicity, a young lady living in the heart of London who has Epilepsy and experiences what she described as vacant seizures. She had been trying to get an assistance dog to give her security and assistance as she was vulnerable when having seizures. The procedure was proving very challenging due to the criteria potential assistance dog handlers have to meet. We discussed her requirements and agreed to work together to provide her with a seizure response dog. I found a suitable dog, a nice natured 14 month old black labrador dog and with the agreement of Felicity began training him. Initial training was focussed heavily on environmental work and basic training (he did like to pull on the lead). I then moved on to specific assistance training which included lying with me when simulating a seizure, locating and fetching a handbag and mobile phone on command. I was in regular contact with Felicity including trips to London to ride the train, tubes and buses. In February 2015 Felicity collected her new dog and has had him as an assistance dog since then. He has been a great success and has begun to detect oncoming seizures alerting Felicity who can get herself to a suitable location before it happens. I enjoy receiving updates from Felicity as their relationship grows and am very proud to have been able to make a difference to her daily life, helping to improve her independence. In the summer of 2017, I was contacted by Steve who wanted a dog to be a wellbeing dog for his 14-year-old son Tom, who has Autism. Again, difficulties matching the necessary criteria made obtaining a dog through a charity problematic. We discussed the type of dog they were after and what they were hoping it would provide. We agreed to work together to get Tom that special friend. Steve was keen to have the dog trained from a puppy. Tom was clear he wanted a Yellow male Labrador - nothing else would do. I found a lovely litter of puppies in Bodmin, Cornwall that included four Yellow boys. I had my Father give the litter the once over before travelling down to see them myself. I spent some time viewing and playing with them before settling for "Mr Brown” (they all had different coloured collars). From that moment Mr Brown became Rex and I collected him 2 weeks later on 23rd October 2017. Training has been going really well. Rex completed the majority of his environmental training in the first few weeks and is comfortable with most things including noise, traffic, people and other animals. We have been working hard on his basic training keeping it fun and happy. He is a lovely dog full of character and as of January 2018 is well on the way to being that special friend Tom and his Dad Steve is looking for. You can follow Rex's progress on my facebook page. If you have any questions or just want to say hi?